Congrats on your purchase! Just curious, did they change the wheel caps now? Mine came with the ones that were seen during/around its launch. Thanks. As anycatd mentioned, I had the dealer exchange the wheel caps with the ones from Baleno since they both are of same size. I had asked for black color but they claimed it was out of stock so went with the silver color version. 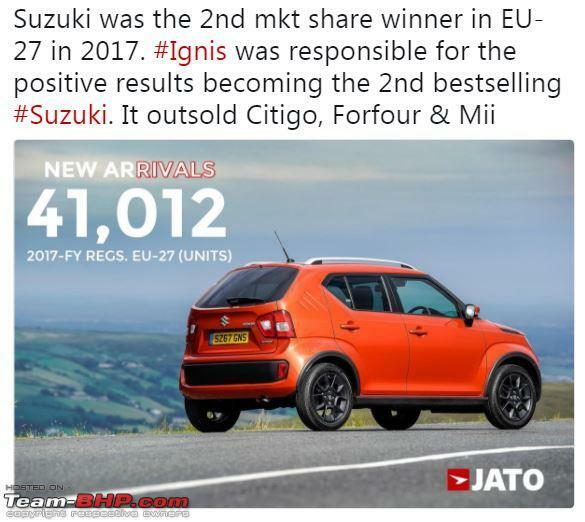 The little IGNIS takes SUZUKI to great heights in Europe sales in 2017. Last edited by volkman10 : 30th January 2018 at 14:33. Guys, need an urgent help. A friend booked Urban Blue Ignis (Top-end Alpha) Petrol from Nexa, OMR, Chennai almost 2 weeks back. Today he got a call from the Sales guy stating that the Urban Blue colour option has been stopped by Maruti. This is a big upset for him as both he and his wife love the colour. Is it true that the colour is not available? I see lots of Urban Blue Ignis on the road and it's one of the best selling colours in that car. Today he got a call from the Sales guy stating that the Urban Blue colour option has been stopped by Maruti. Inquire at another Nexa, including cities around Chennai like Vellore. Its quite likely one of them has one lying in their yard. 2. Is it true that the Nexa Card will be mailed by Suzuki after few weeks? How much did you pay for the armrest? Either thay will send the Nexa card to your address or the RM will deliver it to you. In my case they took around 6 months to deliver the card. 9. Took finance from SBI. I was told that the processing charge would be Rs. 1K + taxes. However, the document that I was asked to sign had Rs. 2K mentioned. Upon confrontation, the SBI agent said that their system has this by default and told me that the 2K charge from my account will be reversed. Should I take his word for that? Anyone have experience with SBI loan? Yes, the 2K charges stands true, had financed a friend's Scorpio S11 few days back and because he didn't have money in that particular account, I asked them to debit it from my account. That is for agreement paper [stamp charges] and other miscellaneous, maybe the processing charges. On other note, I too am planning for this or the Grand i10 or the Swift or the WagonR. Am interested in knowing about the arm rest. This small car will do city runs only and will be driven by a chauffeur. Paid Rs. 1750 for the armrest. My rationale for not going with the cars that you mentioned is as below. Please note that I was interested only in AT Petrol version. Grand i10: definitely better driving performance than IGNIS. Very poor mileage; lack of ABS; higher cost compared to Ignis delta amt. Swift: AT option was not available then. WagonR: doubts over long-term success of amt technology with 1k cc engine (IGNIS has 1200cc). Ignis 1.2 petrol is a hoot to drive . Not sure if it lags the performance vs grand i10. My car has crossed 10000 km and delivers effortless city performance with consistent 17+ kmpl. 17+ kmpl is amazing, is your car the manual variant? Is this by the tankful method or the dash readout? My Alpha AMT petrol has completed 1100 kms and the dash readout has never crossed 9.3 kmpl. What mileage do other folks get within the city? I drive in bumper to bumper Bombay city traffic all the time. Yes its a manual. The economy has been measured on tankful as well as the display and consistently stays upwards of 17kmpl. 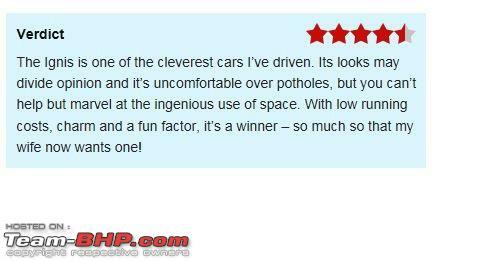 Long term (10 months) test review by Auto Express ( UK)- This is a typical view and contributes to its success in EU. After 10 months on the fleet, our Ignis has returned to Suzuki, and we are already missing it. Over the best part of a year, the car has proven itself to be so much more than an unusually cute-looking small SUV. My family liked the Ignis from the start, but the longer we ran the car for, the further we fell for its ‘park anywhere’ dimensions, clever interior and fuel-sipping engine. Last edited by volkman10 : 21st February 2018 at 19:49. My wife drives an Ignis AMT about 80 kms per day on a winding ghat road with low traffic. The car has clocked about 8000km. The MID display is always between 19 and 19.5 kms/L. However, I have never measured tankful to tankful. The ignis is really frugal with petrol. Drove the Ignis alpha diesel amt yesterday and was mightily impressed. The amt is no where like the trash I drive in kwid. The shifts were very smooth. The seating was pretty comfortable. NVH was under control. The ride quality was surprisingly planted. You get a nice view of the road. The LED lights are top notch. We get apple car play, android auto, navigation, just the full kit. Getting a discount of 50k and an on road price of 9.5 Hyd including rear spoiler and leather seats. How is the highway stability and the overall ownership experience? Would really appreciate if diesel amt owners could share their experience. Thank you! Its very light and tallish and not really highway car. Its an urban/suburban runabout. For highway use consider the new Swift or the Baleno. In addition, AMT and overtaking requires a bit of preplanning. I cannot comment on the Diesel, as what I own is a Petrol AMT but the high speed manners should be similar on both. I would say the highway stability is excellent - this is possibly due to the suspension being on the firmer side. Even though the vehicle is tall it feels planted at speeds up to 120 kph. The Build quality also feels better than the Baleno although both are on the lighter side.